Cook the bacon to the level of doneness you prefer. It will not cook any more once you stuff the jalapeños with the cheese. Let it cool and chop it into bits. Prepare the Home-made Boursin-style Cheese Spread and mix in the bacon, cheddar, and pineapple. Put on rubber gloves to work on the peppers. If you are going to halve them, with a thin sharp filleting or paring knife, cut the stems off and discard them. Then cut them in half lengthwise. Run the blade along the inside wall of the pepper removing the seeds and the white ribs. If you like hot stuff, leave the ribs in. If you are going to leave them whole and cook them in a rack, slice off the stem and cap and use a potato peeler to remove the seed pod. It will be hard to remove the ribs this way, so they will be hotter than the sliced peppers. Spread the cheese mix into the peppers, but not so much that it will overflow when cooking. To make them one-eyed, put an olive at the stem end. Sprinkle the paprika on top. 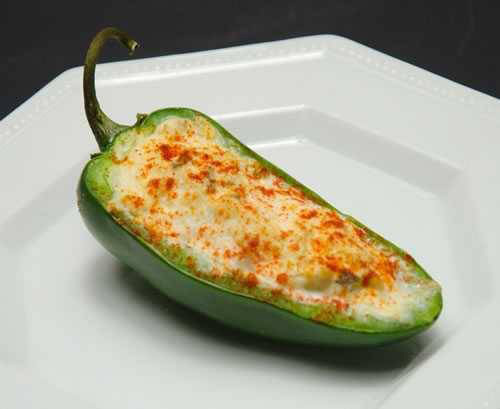 Fire up the smoker or grill with a 2-zone setup and cook at about 225°F over indirect heat until the cheese melts and the pepper gets a little soft. Try not to let the peppers go limp, they're better with a little crunch. Remove gently with a spatula and let them cool a bit before serving. They are also fine at room temp or right out of the fridge. Make sure you have plenty of cold beer on hand. This entry was posted in Other's Recipes, Vegetables by . Bookmark the permalink.